In need to have a safe online transaction? If you have a UnionBank EON Visa Debit card, you can utilize its use by linking it to your Paypal. With Paypal, you will be able to perform online transactions worldwide. If you have an unverified Paypal account and you wish to verify your account, having a UnionBank EON Visa Debit card is one method. With that, you can now have transactions with your Paypal and fund your account using your EON Visa Debit card. If you still don’t have one, you can sign up for a Paypal account in their official website. Before linking up your accounts, make sure that you have at least 200 php in your EON account. Paypal will then verify if your account is active and will credit the amount after the process. 1. For verified accounts, just click on “Add Credit/Debit Card” and choose the “Add Card” option. If not, click “Get Verified”. In Paypal, you may link up to 8 cards to your account however you can only register one card at a time for your own account’s safety and security. Then use this information to fill out the details of UnionBank. 2. You will be asked to enter the 16 digit found in your EON Visa Debit Card. This can be found in front of your card above your name. You also need to enter the Card Verification Value (CVV) which is the last 3-digit number on the back of the card. To successfully verify, instead of your account number, put it your EON card number found under your name. 3. Next, we will now need the Paypal Code (EXPUSE) number. This 4 digit number will be used to finally verify your Paypal account. You can get this code in your Billing Statement after enrolling your EON account to the UnionBank’s Online Banking facility. You can also find this by viewing your transaction history online. When done, log in to your account and click on the “Finish Expanded Use Enrollment” tab on your Account Overview page. Key in the EXPUSE code and you will then receive a message confirming your verified Paypal account. 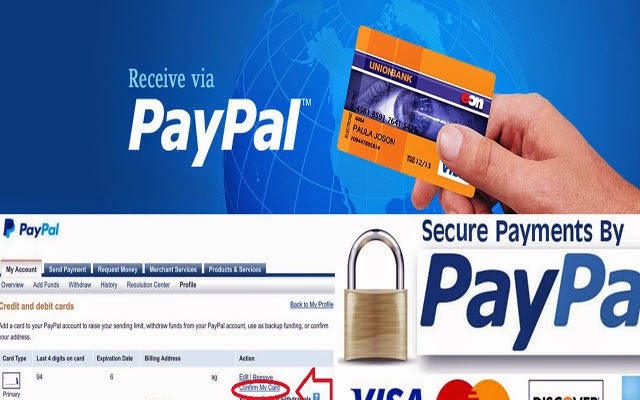 Click here for Complete and step by step instruction on how to verify your Paypal account. This will take up to 2 days. When successful, you have now linked your EON account to your Paypal and verified your Paypal account. You will now be able to shop online in various websites or even send money to pay your bills. For users, it is highly recommended to use a strong password or buy a Paypal Security Key to add more security in your account and avoid being a victim of online fraud.